I have to admit that I’ve always been a little leery of making tamales, I mean, leave it the experts right? I’m fully confident of making desserts, pastries, and other main dishes but never once have I even attempted to make one of my favorite foods, the tamale. 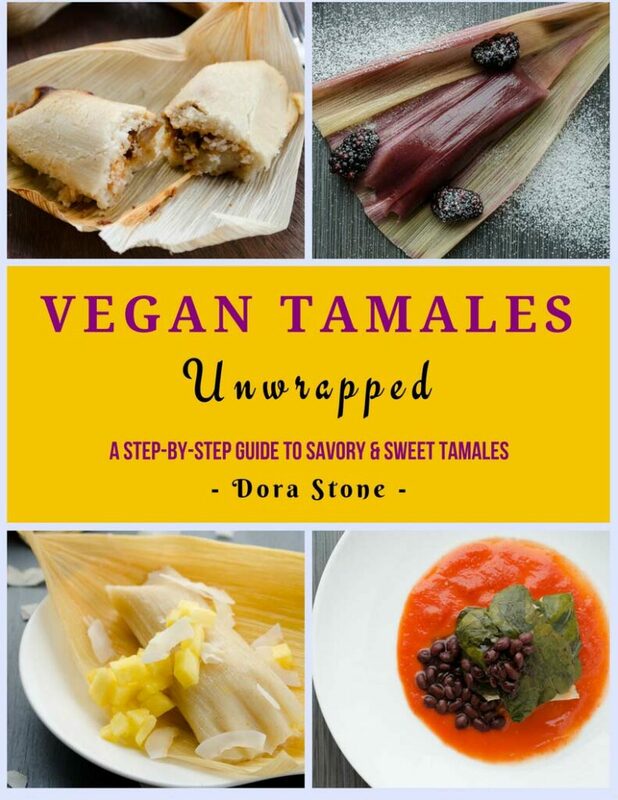 That is, until I was given the chance to check out a copy of Vegan Tamales Unwrapped: A Step by Step Guide to Savory and Sweet Tamales from Dora Stone of Dora’s Table. Then, as fate would have it, I also happened to catch an episode of Diners, Drive-ins & Dives which featured a lady making tamales! It didn’t look too hard. SO with my new found confidence and ebook in hand, I committed to making Dora’s Red Chile Jackfruit Tamales. I gave myself the entire morning to shop and make these tamales and what I found, was that although a little time consuming, it was actually a pleasant experience when I had my trusty sidekick (a.k.a. Xander) to help me. We made an awesome assembly line. I cut the dried peppers and he pushed out all the seeds. I taught him how to peel fresh garlic and chop an onion and then I blended everything and made the sauce. He was my taste tester and added the perfect amount of salt to finish it out. Then we got to the part of filling the husks with our prepared masa and filling. Dora’s ebook is very detailed on how to do it exactly, and it was so simple to follow. Xander loved wrapping each one with a little corn husk bow! They look like pretty little packages, don’t they? Probably, the best part, was actually eating the tamales! They were absolutely allergylicious and the red chile sauce brought just the right amount of heat! With a few extra tamales left over, we tried a few other fillings. Shredded chicken for my non-vegan boys and sliced avocado for myself because avocado is awesome! Everyone was happy! 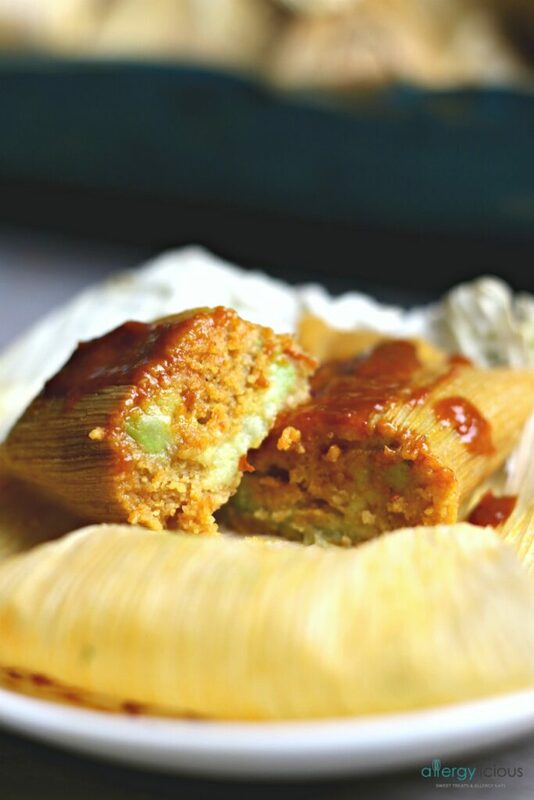 These spicy vegan tamales are made with spicy guajillo chile seasoned jackfruit and masa, stuffed inside corn husks and steamed to perfection. To prepare the corn husks: Soak the corn husks in hot water, in a large pot or in your kitchen sink. Place a plate over them to weigh them down so they are completely submerged. Let them soak for at least an hour. To make the sauce, place the chiles in a small sauce pot and cover with water. Bring to a simmer over medium-high heat and let cook for about 10 minutes. Drain the chiles and reserve 2 cups of the soaking liquid. Place the chiles, garlic, onion, and soaking liquid in the blender and process until smooth. Season with salt and pepper and strain. You should end up with about 3 cups of sauce. To make the filling: Drain the jackfruit. Rinse, and pat with paper towels. Cut out the core of the jackfruit (tip of the triangle pieces), and cut pieces in half. Heat 1 tbsp. of oil in a large sauté pan set to medium heat. Add minced garlic and cook for 1 minute, stirring often. Add the jackfruit and cook for 3 -4 minutes or until it begins to brown. 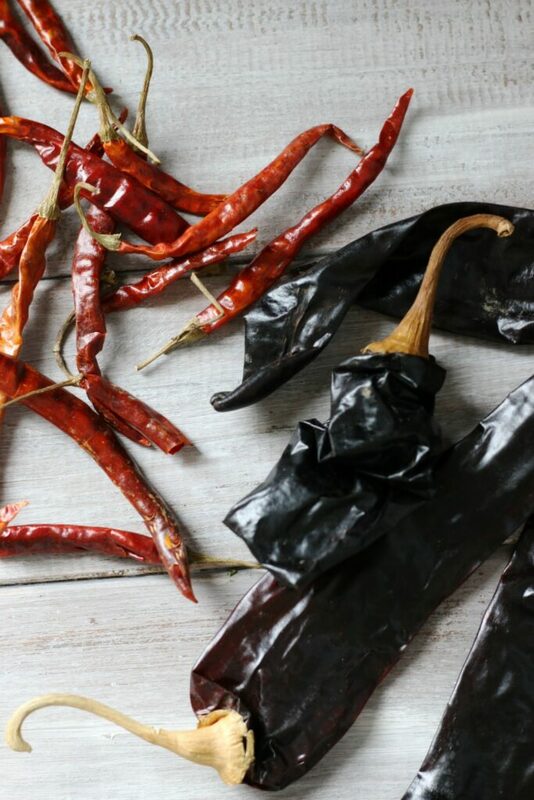 Pour 1 ½ cups of the guajillo chile sauce and reduce heat to low-medium. Simmer for 20 minutes or until jackfruit begins to break down and the sauce has thickened slightly. Use a fork to shred the jackfruit as it cooks down. Season with salt and pepper and let cool. 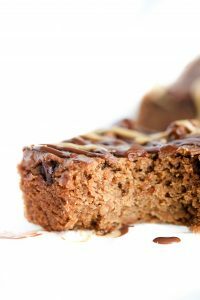 To make the dough, beat the coconut oil, on medium-high speed, with an electric mixer for 1 minute. Add the baking powder, cumin, salt, and beat for 1 minute to incorporate into the coconut oil. For lighter and fluffier tamales, let the dough rest for an hour in the refrigerator. Remove the dough from the fridge and repeat it, adding enough liquid to get it to the consistency it had before. To wrap the tamales, pull 24 pencil thin strips off of the corn husks and set aside. Take a husk and dry off the excess water with a paper towel. Place the husk in your hand with the tapered side away from you and the smooth side up. Using a spoon, spread 2-3 tbsp. of the dough (¼ inch thick) onto the corn husk, forming a 3 – 4 inch square. Leave a border of at least 3/4 inch on each side of the square. Place 1 ½ tbsp. of the filling in the center of the dough. Bring the two long sides of the corn husk together, this will cause the masa to surround the filling, and roll them in the same direction around the tamal. (If the husk is too small, fold one of the long sides towards the center, and then fold the other long side on top.) Fold down the empty tapered section of the corn husk, forming a closed bottom. This will leave the top of the tamal open. Tie with a corn husk strip to secure the bottom of the tamale. Place the tamale in the steamer vertically leaning against the side of the pot, with the open end on top. Repeat this process until you run out of dough and all the tamales are in the steamer. Cover them with a layer of corn husks. If the steamer is not full, fill the empty spaces with more corn husks. Cover the pot and bring the water to a boil. Turn heat down to medium and cook for 40 minutes. Check the tamales, when they separate easily from the corn husk it means they are done. If they are not done, steam for 10 more minutes and check again. A few other recipes from Vegan Tamales Unwrapped that I’m looking forward to trying are the Potato Adobo Tamales & the Chocolate Tamales. Don’t they look good! 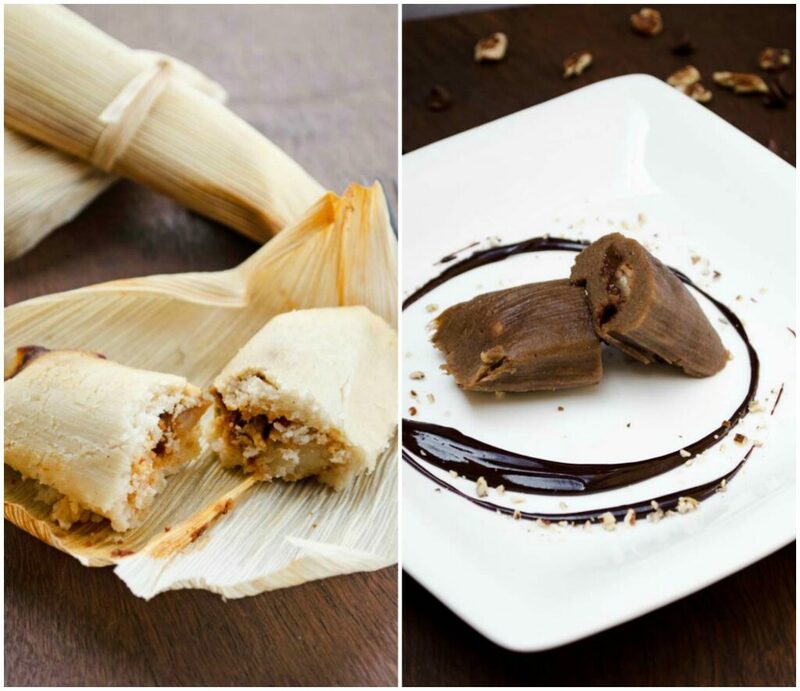 Finally, you can grab your ebook here and start having fun with making your own tamales! I love hearing from you and seeing your awesome remakes! 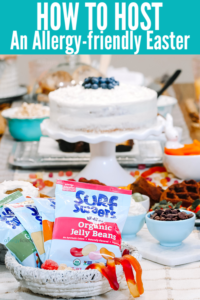 If you make this, be sure to find me on Instagram and tag me @allergylicious and #allergylicious too! 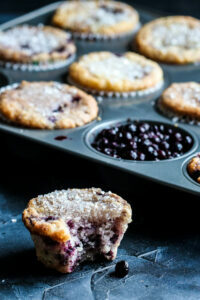 You can also find me on Facebook & Pinterest sharing the newest, delicious, allergy-friendly foods! Here’s to trying new things and making them Allergylicious! These look so good! I can’t wait to start cooking out of this book. I’ve enjoyed a few recipes so far! These look so amazing! You had me at spicy, but you also had me at tamales!! I’m hungry all over again! 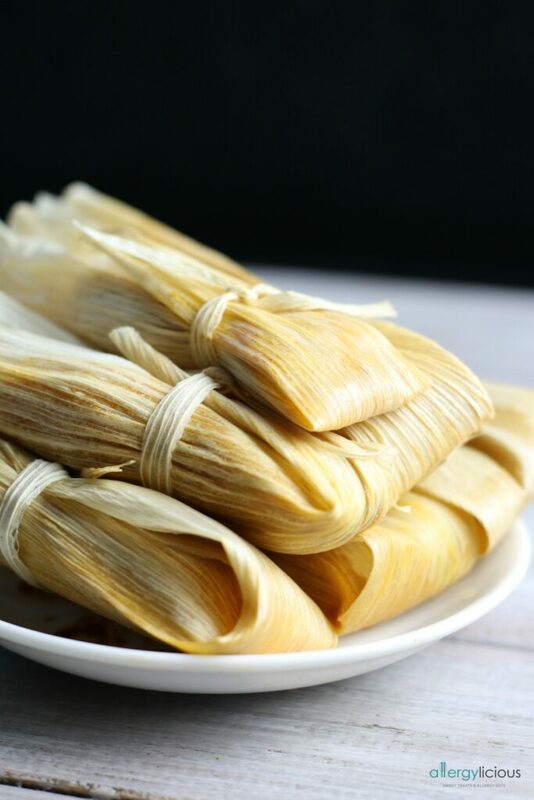 I’ve always thought that tamales would be a pain to make, but I love how easy these are! I thought the same thing, but other than being a little labor intensive (at least until you get the hang of it), they were quite simple to make. Can’t wait to see what you fill your tamales with! This book had so many ideas I never even thought of. I have never ever tried a tamale but I know I would love everything about them! Perhaps I should give them a try! Jackfruit was at so many vegan booths at Expo West this year, and I have to admit, for most of them, I definitely wasn’t impressed. They were trying to make the jackfruit fit in places where it didn’t. But tamales seem like the PERFECT match. Thanks for sharing this Nicole. I can’t wait to try homemade tamales myself! I think you are right, there has to be the perfect place for jackfruit to be used. This recipe worked great and when I ran out, I just subbed in big pieces of avocado and vegan cheese. That worked awesome too. I just never realized how easy it was to make tamales (although it took a bit of time). I love tamales! I agree that they are a little time consuming, so I don’t make them as often as I would like, but you are right—once you get in a rhythm they move along! My 2 year old loves to help me in the kitchen—he comes running in and says “Mama, I help you!” I’ve always got company in the kitchen! That’s awesome! My little guy was my helper as well and it was so great just spending that time together! Hi Nicole, thank you so much for sharing the recipe and your kind words about the book. I’m glad you enjoyed the tamales. Oh goodness, thank you! Making these pushed me to do something I had always wanted to try. It was so easy. Can’t wait to make more of the recipes from your book.